DENVER, CO / ACCESSWIRE / March 31, 2017 / Greg Didier, a golf fan from Colorado, is pleased to announce the upcoming launch of Caddy Slacks - Simplifying Golf with six special features. To watch a short video of the Caddy Slacks in action and learn more about the revolutionary and comfortable new pants, please check out https://goo.gl/yal6to at any time. As Didier knows quite well, playing golf involves constantly reaching for a variety of tools, including a ball marker, score card, gloves and more. Many golfers find that they spend as much time fishing in their pockets for their tees and other tools of the game as they do planning their next shot. This knowledge inspired Didier to create and launch the Caddy Slacks, which are sharp-looking golf pants with six special features not found on any other golf pants or shorts. 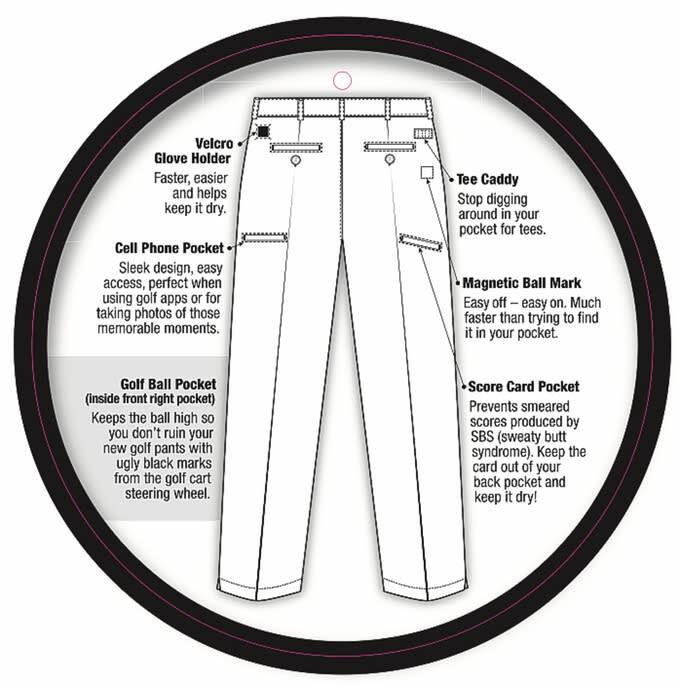 In addition to being comfortable to wear, Caddy Slacks include a handy spot where a ball marker is magnetically connected to the outside of the pants. Located just below the back right pocket, it is easy to slide on and off and is interchangeable with a golfer's favorite magnetic mark. "The tee caddy is located on the right hand side of the pants between the back and front pockets for easy access," the spokesperson said, adding that the pants also include a pocket created just for the score card. "The glove holder on Caddy Slacks is located on the left hand side between the front and rear pockets. Simply take your glove off and stick it on the patch. Not only is this much easier, but it also helps to keep it dry." A cell phone pocket and ball pocket round out the six features that help Caddy Slacks stand apart from the competition. In order to help pay for the production and marketing costs associated with launching his Caddy Slacks to the public, Didier recently started a fundraiser on Kickstarter. There, he hopes to raise $25,000 through crowdfunding and help make the game of golf more enjoyable, one pair of pants at a time. Caddy Slacks are designed to make playing golf a more pleasurable experience by keeping players out of their pockets as much as possible. The pants offer six unique features that are designed to simplify golf by providing easy access to the tools golfers use on most every hole. For more information, please visit https://goo.gl/yal6to.